Most people don’t look at the underlayers of what a runner or athlete is wearing. Most people think that you simply throw on a t-shirt and some runners – and you’re good to go. But what people don’t realize is that the underlayers of an athlete’s attire are a huge support in giving them their best run. So, whether you’re out on the field playing a game of football or running through the woods on a cold, brisk morning, you’ll be wanting to make sure you’re wearing the right clothing. That being said, you need to know what the best moisture wicking shirts currently are. Before we even touch upon the best wicking shirts available, you need to know the basics. First off, wicking is a term that’s used when speaking about the fabric of clothing. Wicking basically means that the fabric pulls moisture away from the skin as opposed to the regular fabric which allows the moisture to seep into the skin. What happens is that the body is kept dry and cool, so even if you’re sweating, your body is able to maintain a regulated state. Wicking attire can also act as exceptional base layers because they can act as insulators. But what makes the fabric different than a regular cotton shirt? Is there really a difference? There actually is a difference between wicking apparel and non-wicking apparel. Wicking apparel is designed using capillary action. What this means is that the fabric is made of miniature tubes, designed similar to human capillaries. What these fabric tubes do is push the moisture up into the tubes, away from your skin and out through the fabric. For example, if you’re running, your body is starting to sweat. Thus, the sweat begins to develop on your skin and gathering on the underside of your shirt. However, because you’re running, you’re also creating an airflow which is lower in humidity which assists in acting as a natural air dryer. The air helps push the moisture up to the surface of your shirt and then evaporates into the air. Not all fabrics are made with wicking. That being said, you need to know which ones to keep out of your running wardrobe. If you decide to wear cotton, then you love to torture yourself. There should not be one cotton shirt in your running closet. It’s a huge no if you’re planning on doing an activity that will require you to sweat. Why? Because once cotton becomes wet, it stays wet. If you’re running during the cold winter months, wearing a cotton shirt will land you in bed with a cold. In addition, cotton also makes you more susceptible to chafing. So, if you’re neither a fan of chafing or becoming ill, then stay away from cotton. You probably think bundling up is a good idea, well, it’s not bad if you’re going for a walk. However, if you’re planning on getting sweaty, then less is more. If you wear too many layers, you run the risk of overheating. Opt for wicking layers which remove the moisture and reduce bulk. It’s not because you’re going to look like Rocky Balboa, but rather because sweatpants are made of cotton and cotton is a big no-no. Sweatpants used to be very fashionable in the athletic world, however, they’re not as practical as you think they are. Sweatpants aren’t actually designed for sweating, more for hanging out. So leave you sweatpants for home and opt for running tights or pants that are lightweight and made of wicking fabric. Running shoes aren’t cheap, however, the physiotherapist appointments you’ll be needing after running in a pair of old shoes will cost you more in the long run. They may look like they’re in good shape, however, if you’ve been wearing your shoes for 300 miles, then it’s time to replace them. Over time, running shoes lose absorption, cushion and stability – three crucial elements you need if you want a supportive and safe run. So, when you head to the stores, what are you supposed to look for in athletic apparel? Lightweight: There’s nothing worse than running with a load on your back. You want to make sure your apparel is designed to be lightweight. This is highly connected to wicking fabrics as they don’t hold moisture which is notorious for packing on unnecessary pounds. Moisture-wicking: You’re going to be sweating, but you don’t need the constant reminder while you’re running. Moisture wicking material removes the moisture away from your body, keeping your skin dry and chafe-free. Quick-drying: Unlike cotton, you want fabrics that’ll keep your body dry. It helps you stay comfortable and the quick drying feature prevents you from getting a cold. Chafe-free seams: It’s a nice feature to have, especially if you’re prone to chafing. Chafe-free seams are placed away from chafe-prone areas, creating you an uncomfortable sensation that could alter the way you run. What are the main types of moisture wicking fabrics? Now that you’ve been updated on fabrics to stay away from, what fabrics out there are moisture-wicking? Though certain brands have their own specially formulated products with their own blends, typically, there are three main fabrics which are the most commonly used in the market. Polyester: Polyester is moisture-wicking and quick-drying, however, can be marketed as a variety of names. However, most of the athletic apparel on the market today is made with polyester due to its moisture resistant characteristics. Merino Wool: Merino wool is another fabric which is used due to it’s moisture-wicking and quick-drying properties. In addition, it also is antimicrobial so if you tend to get a good post-workout odor going on, this will help you fight it. It’s also a great temperature regulator, so whether it’s a hot or cold day, you’ll be content. Nylon: Nylon is also quick-drying and moisture-wicking and can be used alone or as a blend. It’s highly durable and is seen in many athletic pants, shorts and jackets. It’s a lightweight material so you won’t feel weighed down while working out. 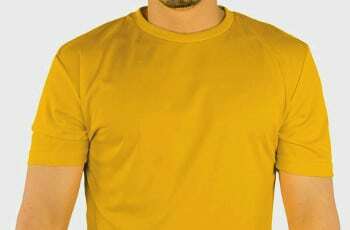 Now that you know the features and the types of moisture-wicking fabrics available, it’s time to look at the top seven moisture-wicking shirts available on the market. Let’s take a look! If you’re not looking for a t-shirt that comes with all the extra bells and whistles, then this is the shirt for you. It’s simple in design, comes in a variety of colors and keeps you dry. It’s made of 100% polyester interlock that is one of the best moisture management materials on the market. These shirts are designed to fit you perfectly, neither too baggy or too tight, which is what you want in a workout/outdoor shirt. These shirts won’t limit your range of motion or create any discomfort. They’re lightweight and dry quickly, so you won’t have to worry about being weighed down by sweat. A perfect shirt for heading to the gym in or going for a hike. What’s even better is that they’re very modest in price, so you’ll be able to buy a couple shirts without hesitation. Related: If you’re looking for a crew neck t-shirt, then look at the A4 cooling performance Crew short sleeve. It’s made of 100% polyester interlock and will keep you dry and cool with its moisture-wicking design. It’s also odor resistant and is made with stain release material that’ll keep it nice and fresh. Augusta Sportswear has been around for quite some time, since 1977 to be exact. This small company is now highly well-known for their sports apparel. The men’s t-shirt is made of 100% polyester and is designed to not only keep you dry but to also provide you ultimate comfort. It’s tailored to give you the perfect fit without restricting your body’s range in motion. The design is highly modern and Augusta didn’t want to create a t-shirt that made their clients feel outdated and old. This t-shirt comes in a variety of colors and looks extremely fresh and vibrant. They’re also highly durable and are able to withstand the wear and tear that comes along with working out and playing sports. What’s great about Augusta is that they understand the needs of their clients and you can see that in their products. Related: If you want a long sleeve shirt instead, Augusta has their Men’s wicking long sleeve which is a 100% polyester wicking knit. It has a double-needle cover stitched collar and double-needle hemmed bottom, so it’s highly durable and built to last. Though t-shirts are great, sometimes you want to wear something a little warmer during the cold winter months. So, of course, there are long sleeve options for moisture wicking athletic wear. The DRI-EQUIP Athletic Shirt is a long sleeve shirt that’s lightweight, spacious and highly breathable – all the essentials for a moisture wicking shirt. It’s made of 100% cationic polyester, so you can be sure that the moisture is going to be kept away from your body. It also is designed with set-in sleeves, so you’re given a secure fit. It comes in a variety of colors and sizes, so you’re given the option of mixing and matching. A great long sleeve shirt to wear that’ll keep you nice and dry. Related: If you want a short sleeve version, DRI-EQUIP also has the Short Sleeve Athletic Shirt. It’s lightweight and made of 100% cationic polyester interlock with set-in sleeves. You’ll be kept dry and comfortable in this t-shirt. Plus, it comes in 23 colors, so you have plenty of options to choose from. With moisture wicking technology becoming the trend in the fitness industry, so many companies are jumping on board and creating shirts that are trendy, however, way out of an average price range for a t-shirt. Mato & Hash’s moisture wicking shirts are made 100% out of polyester, but don’t have the giant price tag attached to it. Their moisture wicking shirts ensure that you stay dry during your intense workout or morning run. Polyester is one of the most popular materials for moisture wicking because of their reliability and moisture management. In addition, the 140 GSM polyester is designed to provide you maximum comfort due to its breathability. You won’t have to worry about these shirts being too baggy or too tight – these shirts will give you the perfect fit you’ve been looking for. They also come in 8 vibrant colors, so you’ll be able to stock your closet with a couple different shirts that you’ll be able to wear whenever you need. Related: Another decent brand for moisture wicking t-shirts is Hanes. The Hanes Cool Dri Performance t-shirt is made of 100% polyester interlock with a 50+ UPF rating, so you’ll even get that extra protection from the sun. Their shirts are double-stitched so they’re made to last. A solid t-shirt and the price won’t come close to putting a hole in your wallet. The Vaiden sports shirt is made of 100% polyester which provides you with a lightweight feel. The soft material removes any feeling or irritation or chafing on the skin. The shirt isn’t as form fitted, it’s more designed for those who prefer a slightly looser feel, however, it doesn’t look baggy or sloppy. What’s great about this shirt is that it’s designed to not only keep you dry by to fight off any odor. The Silver Ion Technology used in this shirt provide you with antibacterial properties, so any odors will be eliminated, keeping you staying fresh. These shirts are also not limited to any activity – you can wear these while playing basketball, football or while you’re running. It’s extremely versatile to your needs. In addition, it’s also certified and environmentally friendly, so if you’re cautious about your environmental footprint, know that Vaiden manufactures their products in an environmentally friendly textile production. Related: If you’re also looking for a pair of shorts to go with your moisture wicking shirt, Vaiden has their wicking shorts which are great. They allow breathability, superior comfort and are designed with moisture preventing engineering. If you’re needing a more formal shirt, however, you don’t want to wear a cotton button-down, we don’t blame you. Cotton attracts sweat and that’s not what you need when you’re going to a family BBQ. So, Gerry designed the renegade field shirt. It’s a button-down t-shirt which isn’t as casual as a typical t-shirt, however, you can wear it while playing sports or at a lunch, it’s versatile. What’s great about this shirt is that it comes with 40+ UPF protection, so you won’t have to worry about your skin under your shirt. The moisture wicking is made with 4-way stretch fabric due to its polyester and spandex blend. It’s wrinkle resistant, which many of you will love since you won’t have to worry about ironing. It has a zippered left chest pocket and ripstop fabric for durability and extra strength. A great option that provides you with a lot of versatility. Related: If you’re looking for a pair of casual shorts but you also want moisture wicking action, well we found a pair of shorts for you. Gerry Men’s Shorts is moisture wicking, yet looks like a very casual pair of summer shorts. You can dress these up or down, whichever you prefer. You’ll stay dry and comfortable the entire time you wear them. There are times when you won’t want to wear a workout t-shirt even though you’ll be outside, working up a sweat. Some people prefer to wear polo t-shirts, especially if you’ll be golfing or at a bbq. These polo shirts are high moisture wicking due to their specially engineered U-R-DRI technology that adds high moisture wicking properties to the polo shirt. These polo shirts are designed for you to be able to withstand long hours performing activities which cause you to sweat. Though you will be sweating, these shirts ensure that it’ll do the job of keeping you dry and comfortable. Another great part of this shirt is the odor-resistant design – you won’t have to worry about being smelly after a couple hours out in the sun. If you’re not the type of guy who enjoys shopping, these shirts are built to last you a long time, so with a couple of these polos in your closet, you’ll be set. In addition, Premium offers everyone a 100% risk-free satisfaction guarantee, so if you don’t like the product, you can get your money back. Related: If you’re a polo fan, the Hanes Cool Dri Performance Polo is another option that’ll give you a cool and dry experience. It’s made of 100% polyester and has fast-drying technology that’ll keep you nice and dry. The 50+ UPF rating also provides you addition UV protection while you’re outside. Now that you know what moisture wicking is, the types of materials used and the features you need to look for, go out and try on the top moisture wicking shirts we reviewed for you. Make sure that your moisture wicking shirt fits properly and gives you a comfortable range of motion. The moisture wicking shirts we reviewed above are the best of the best, so let us know in the comments below which shirt you liked the best!